The atlas is a first step to improve the networking of German-speaking stakeholders in terms of fish protection and downstream fish migration. A newly created atlas for fish protection and downstream fish migration ("Atlas Fischschutz & Fischabstieg"), designed and implemented by Ecologic Institute, is online since June 2016. The map indicates all the locations of measures for fish protection and downstream fish migration complemented by information taken from associated studies. Furthermore, the filter function highlights specific research and development projects as well as information regarding specific basics and activities. Stakeholders in terms of fish protection and downstream fish migration are invited to add new content to the atlas. "Atlas Fischschutz & Fischabstieg" is divided into three parts. The map indicates all registered locations including measures for fish protection and downstream fish migration. These don't only include constructional installations to fish protection and downstream fish migration (e.g. rakes, bypass), but also fish friendly turbines, installation operating modes and installation designs, too. The atlas entries likewise contain information about implemented associated studies (e.g. functional check, monitoring, and research projects) as well as measures over different locations (e.g. catches and transports). The atlas lists research and development studies within the context of fish protection and downstream fish migratio but also conserving the population: e.g., location-based field studies, laboratory tests, literature studies, legal opinions, basic researches, etc. The remaining part includes basic information and activities, such as committee work, forums for dialogue, public relations, plans, programs, guidelines or policies. How to Improve Fish Protection and Downstream Migration in Rivers? Ecologic Institut 2016: Atlas Fischschutz & Fischabstieg. 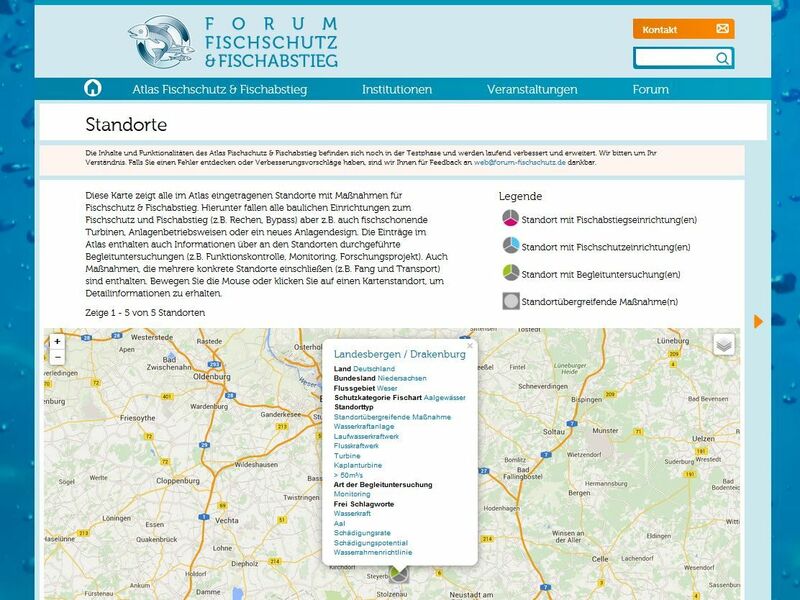 URL: http://forum-fischschutz.de/atlas-standorte.